When it’s cold outside, really cold, and there’s a lot of snow, it’s a good idea to get cozy and watch a move, don’t you think? CREF will serve as your usher – билетëр (biletiyor) and guide for today’s show. Get ready! Lights! While browsing through blockbusters – блокба́стеры (blakbastery), arthouse films – а́вторское кино (avtorskoi kino), shown at various film festivals throughout the year, and live broadcasts – в прямо́й трансля́ции (v primoy translatsii) of theatre and opera pieces, your gaze falls upon a Russian comedy – комеди́йный фи́льм (camedeeny film). You have made an excellent choice. There is no better way to identify cultural differences and similarities than this: what parts of the film make everyone laugh – все смею́тся (vse smeyootsa), what parts do you alone laugh at, and what parts does everyone laugh at except you. Once you have checked showtimes – сеа́нсы (seyansee) on your preferred website – интерне́т сайт (internet sayt), you learn that the film – фильм (film) is being shown at a theatre – кинотеа́тр (kinateyatr) near you. What luck! You do not intend to miss out on this. You buy your tickets – биле́ты (bilyeti) online – на са́йте (na saitey), redeeming them at the ticket booth. 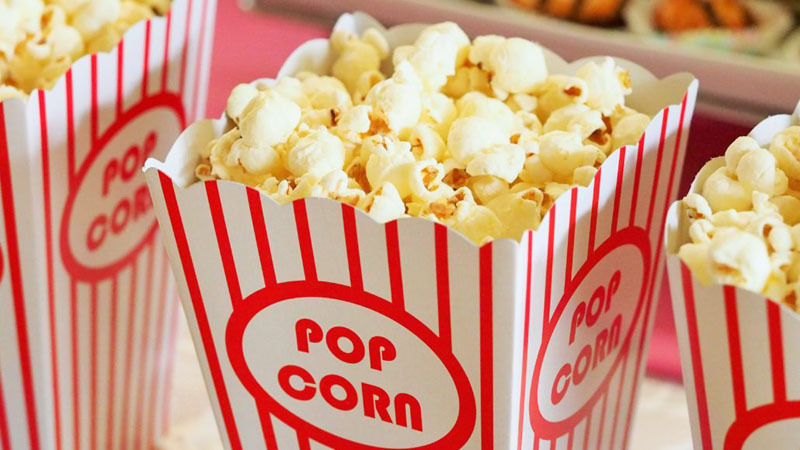 The bar – бар (bar) at the theatre offers various treats, as well as a limitless supply of popcorn – попко́рн (papcorn). You hand your ticket to the usher and enter the hall – за́л (zal). In Russia, cinema seats are assigned in much the same way as they are in a theatre. You have an aisle code – но́мер ря́да (nomer riada) and a seat number – но́мер ме́ста (nomer miesta). Make sure you do not sit just anywhere – куда́ уго́дно (kouda ougodna). The start of the movie is preceded by commercials – рекла́ма (réklama). This is a good time to chat – разгова́ривать (razgavarivat) with your Russian friends. They talk about the quality – ка́чество (kachestva) of the comedy that is about to start. They start discussing French comedies with Louis de Funès and Pierre Richard. Then, they begin waxing nostalgic about Soviet comedies. Comical – комические (kamicheski) or satirical – сатирические (satiricheski), these were so popular that a generation of moviegoers would memorize the lines – ре́плики (répliki) by heart. Try to watch « Garage », « Ivan Vassilievitch Changes Jobs » or « 12 Chairs » to get a feel for the movies of that era. The third one, by the way, consists of two parts – две се́рии (dvé serii). You were under the impression that your friends were American TV show – сериа́лы (seriali) fanatics, and would like to discuss – обсуждать (obsuzhda’) the latest box office hits. But you discover that they are actually cinephiles – кинолюби́тели (kinalioubiteli), fans of art house! Your conversation turns towards the great directors – великие режиссëры (veliki rejissiori) of Russian cinema. Your friends start to quiz you on your knowledge – знания (znania) of cinema. Eisenstein? Of course, the author of “Battleship Potemkin”, “Ivan the Terrible”, a maestro of editing whose techniques are studied around the world. Tarkovsky? But of course, the extraordinary “Andrei Rublev”. More recent directors? You tell them about Pavel Lounguine, Nikita Mikhalkov, Andrei Konchalovsky. They respond with Kira Muratova, Alexander Sokurov, Andrei Zviagintsev. And then, to impress them, you pull out your trump card – козырь (kazyr), quietly praising your decision to attend a Russian silent film festival – фестиваль немого кино (festival nemova kino) in Paris. You were able to admire the cinematography of Dziga Vertov in “Man with the Camera”, the special effects and acting talent of Ivan Mosjoukhine in “The Queen of Spades” by Yakov Protazanov, as well as the adventures of a provincial in Moscow in Boris Barnet’s “House on Troubnaya”. Your friends are pleasantly surprised – прия́тно удивлены́ (priatno udivleni) by your interest in Russian cinema. They ask you to visit the legendary Mosfilm studios – киносту́дио Мосфи́льма (kinostoudia masfilma) with them to see the sets – декора́ции (dekaratsi), film equipment – съëмочная техника (syomechnaya tekhnika), and, who knows, perhaps watch a filming – съёмка (siomka) and hear the famed « lights, camera, action! » – « Ка́мера, мото́р, съëмка! » (camera, mator, siomka!). Your friend Dima tells you that he was once a sound technician – звукооператор (zvoukaapérateur) and that he loved to be part of the film crew – съммчая группа (siomotchnaya groupa). Sasha, she would have liked to work as a set designer – художник-постановщик (khoudojnik-pastanovchik). Sergei, your photographer friend, seems to lean more towards the role of director of photography – главный оператор (glavny operator), maybe even director! And you? You are about to answer when the film starts and all that is left to do is to say, in Russian, “Enjoy the show!” – приятного просмотра (priatnava prasmotra).